The past week has flown by. I meant to post about this tater tot casserole last Friday but never got around to it. I had to pick Jack up from daycare early on Friday because he had a fever. 😦 His temperature bounced around all weekend and he had to stay home on Monday and Tuesday. He’s feeling better now but a sick baby can really zap your energy! On top of that we’ve had contractors at our house last week and this week working in our basement. We finally decided it was time to have it redone. I’m all for DIY but sometimes on big projects like that its worth it to call in the pros. Even though the contractors are doing all the work there are still questions to answer, decisions to be made and supplies to buy, which takes time. And then….Christmas is right around the corner! I’ve completely procrastinated on my shopping this year. I think a couple people might be getting IOUs in a box with a gift being shipped directly to their house next week. 🙂 Note to self: next year start shopping MUCH earlier. 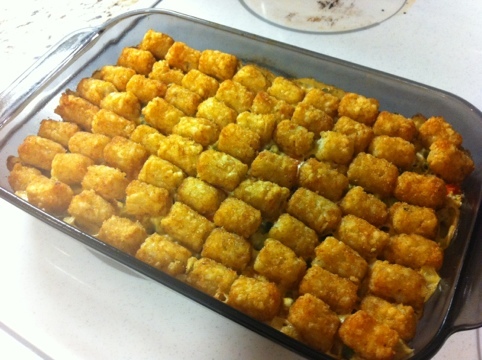 So back to the tater tot casserole. A long time ago my youngest SIL was talking about tater tot casserole and I’ve wanted to make it ever since. I think the original version has ground beef and cheese but being mostly vegetarian (fish is my exception) and currently on a dairy-free diet due to breastfeeding that version wouldn’t work for me. Preheat oven to 375 degrees F. Make cheeze sauce according to directions. If you do not have Veganomicon, try this cheeze sauce recipe or any other cheeze sauce recipe. You need about 2 cups of sauce total. In a large bowl, mix sauce with frozen vegetables. Sprinkle a few handfuls of white Daiya. I only used a few handfuls because Daiya is expensive so I try to make it last awhile. But go crazy if you want to splurge. Add salt and pepper to taste. 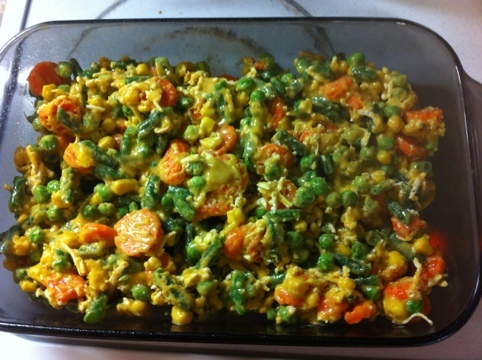 Spread cheesy veggie mixture in a 8 x 8 baking dish. I would’ve used my square baking dish but it was otherwise occupied with snickerdoodle blondies. So I used my other small dish, like a 9 x 13 only smaller. I could go see what size it is but I don’t feel like getting up right now. 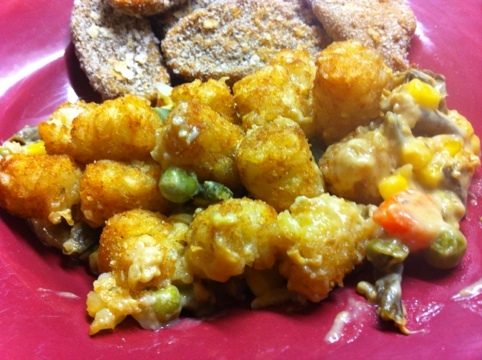 Arrange frozen tots on top of vegetable mixture. Sprinkle the top of the tots with season salt. Bake the tater tot casserole at 375 degrees F for about an hour. EAT! It was so delicious. Benzo said it was his new favorite dinner. I may have to stock the freezer with bags of tots and mixed vegetables so I can make this on a moment’s notice. If you are not interested in a dairy-free version you could easily use Snarky Vegan’s recipe with the white sauce and yellow cheese instead of cheezy sauce and white cheese. Or a cream-of-something soup and a little milk. Lots of options here. By the way we ate this with simple baked seitan strips that I breaded with homemade breadcrumbs. They were good but not great. But I did make another version of seitan last Sunday that was much better. Look for a post on it soon. Ok I’m off to bed. One more day of work tomorrow then I’m off for the rest of the year. Hoping to find some time to bake some treats soon! If she doesn’t like it, maybe I will try using rice in the place of the tater tots. Thanks for the ideas! This was terrific! I added some Boca crumbles and served on a bed of Romaine.